Ian McDonald was born in 1960 in Manchester, England by an Irish mother and a Scottish father. He moved with his family to Northern Ireland in 1965. He used to live in a house built in the back garden of C. S. Lewis's childhood home but has since moved into central Belfast where he now lives, exploring interests like cats, contemplative religion, bonsai, bicycles and comic collecting. He debuted 1982 with the short story "The Island of the Dead" in the short-lived British magazine Extro. His first novel, Desolation Road, was published in 1988. 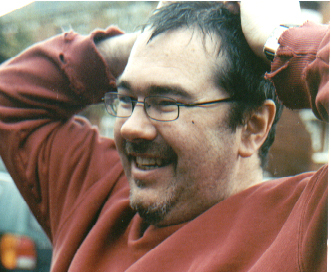 In 2000, Ian joined a Belfast production company, Extreme Productions, as a Network Development Researcher. This basically means coming up with lots of ideas. Links Interviews & Criticism Convention appearances Wanted! Cheap Seats in the Big Church: Guest of Honor Speech held at ConFuse 92. Author/Editor, A panel discussion with Ian McDonald and John-Henri Holmberg from ConFuse 92. The short story Big Chair is available in the electronic version of the ConFuse 92 Program Book edited by Hans Persson (yes, that's me). The short story Some Strange Desire is available on the Infinity Plus website. There is an extract from Kirinya on the Infinity Plus website. Back to the Ian McDonald information page. This page is maintained by Hans Persson. Mail me (unicorn@lysator.liu.se) if you have comments or additions.